What has been exciting about the month of October so far has been the fact of how well it has ushered in Oscar season more directly. There was of course the phenomenon that greeted A Star is Born. Even First Man was met with a lot of favorable reviews, asking audiences to please see it in IMAX. However, the indie releases are starting to shape up with some promising numbers. After all, this is where most of the contenders come from, such as 2016's Best Picture winner Moonlight. It's in the limited release numbers that films tend to prove their merit, and director Felix Van Groeningen's Beautiful Boy has more than done a decent job of proving that it was more than a film festival hit. With this past weekend's opening in four theaters, it has officially become Amazon Studios' highest grossing per-screen average to date. Are Oscars not too far behind? There's a lot of great potential in Beautiful Boy being an Oscar contender, if just because of the performances. Last year, actor Timothee Chalamet managed to earn a Best Actor nomination for Call Me By Your Name while also appearing in Best Picture nominee Lady Bird. He is now destined to have quite a track record as an actor, potentially earning another nomination this year. However, it's interesting that Beautiful Boy succeeded where the critically acclaimed Call Me By Your Name didn't. Could it just be that the subject matter didn't appeal to audiences, or that it was poorly marketed? Who knows, but the fact of the matter is that his latest film, starring opposite Oscar-nominee Steve Carell, has hit some sort of chord with audiences, and has set the bar pretty high. The film premiered on four screens this past weekend. When there, it earned $221,437 at all locations, totaling $55,359 in per screen averages. 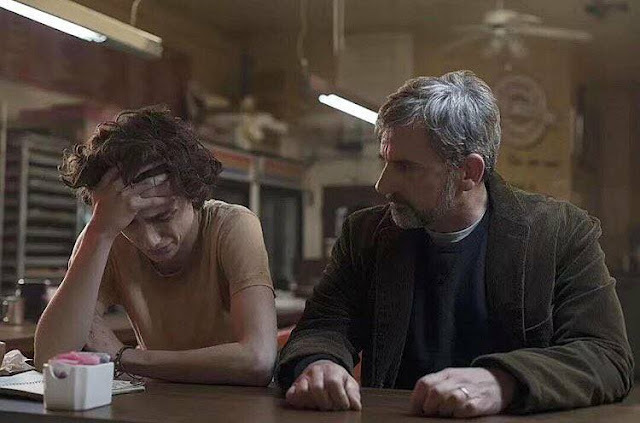 The story of a father dealing with a son's drug addiction has struct a chord with film festival audiences, and has been awaiting a release, if just to see what Chalamet and Carell's chances at carrying it to Oscar night actually are. The film also stars Amy Ryan and Maura Tierney and deals with a subject that feels primed for the modern era, when drug addiction impacts a lot of people. Still, the film's success shows some sign that it could be sticking around awhile. While great limited releases aren't always the indicator, a lot of the Oscar nominees in recent years, like The Grand Budapest Hotel and La La Land, have only benefited from this type of early buzz. Considering the film's success, it also means that it stands a good chance of building as the wide release approaches on November 2. That is of course if the positive buzz remains. It does seem likely though. For now, it seems like another sign that Amazon Studios is far and away more competent at Oscar traction than their streaming service competitor Netflix. While Netflix has some big hits on the way, such as Alfonso Cuaron's Roma, they have yet to strike any sort of relevance at the box office in the same way as Amazon. Beautiful Boy is only the latest in a string of Oscar hits, which had a big jump in credibility with the Best Picture-nominee Manchester By the Sea. It is now their highest per-screen average of any film, which is another welcomed sign. The only question now is how long the film can hold up. Signs are already pointing to a strong yes, though it's important to stay level-headed about these things. There's only a few weeks before its wide release answers the remaining questions.